For young children, time is a mystery. Although given how we choose to spend our time, one could argue that adults don’t understand it all that well either. Still, the concept that time exists at all is far too abstract for a young child to understand. Even the passage of time, which seems so obvious to us, often goes unnoticed by children. I see this first-hand every day in the Montessori classroom. I spend hours each week observing children as they go about their days so freely, finding interest in the tiniest details. As I watch, I often think to myself what a gift it is to be unencumbered by the weight of time. For a brief moment, I even forget about the passage of time myself. Then I take a step outside this wonderful Montessori school and the contrast is jarring. Everything is designed to move us faster. Anything that isn’t moving at our speed has no place -sometimes literally. For instance, my route from school takes me through beautiful rolling hills and old growth forest hiding oaks and gnarled mulberry trees that might have shaded weary soldiers during the civil war. Land which just this week has been razed to widen our two-lane road so more of us can get to places faster. Red foxes, the white-tailed deer have nowhere to go, but they cannot match the speed of traffic. They don’t have a chance. Then I stand in line at the local Panera which serves my lunch so quickly, I can’t believe it is actually real food. Yet apparently the turnaround time is not as fast as I think. In fact, it is so long that people waiting in line must fill the minutes by looking down at their smart phones instead of each other. Perhaps polite conversation takes too long as well. Even human interaction can’t compete with the new speed of life. In a general sense, I’m in favor of doing things faster and more efficiently. One primary benefit of working faster is that it should create more time for us to do other things. More important things -maybe even to slow ourselves down. Unfortunately, it doesn’t turn out that way too often. Somehow we find a way to squander the extra time with more of the same. Nowhere is this fact more evident than in our own education system. Looking back, the copier, computer and the internet all should have have created more time for teachers and students alike. In fact they did. No one would argue that things aren’t much faster and more efficient now than they were in the days of the chalk board and ditto machine. Yet if you ask around, teachers will tell you that the resource they find most lacking is time. Where did it go? Seems to me the grownups took it. Now we have to find a way to give it back. I feel fortunate to have the privilege of returning to my Montessori School to see this every day. If you are lucky enough to have your children attend a Montessori school, I encourage you to spend more time there. If you’ve never been, make an appointment as soon as you can. 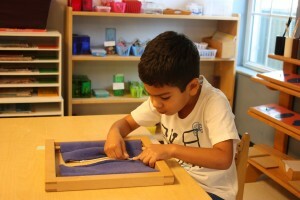 Montessori schools just might be some of the last places in this country where time is not some foe to be conquered. It is a close companion on an open, endless road of possibility. Spend 30 minutes in a classroom and you won’t forget it. Seeing what children can truly do with their time casts an indelible light on what a poverty it is to rob them of it.